Just in case you haven’t heard, spiralizing is kind of a big deal. And for good reason considering if you have a spiralizer you can make healthy (nutrient packed, low calorie and low carb) noodles out of almost any vegetable or fruit! You can also make baked curly fries, which are seriously the best. I’m obsessed. 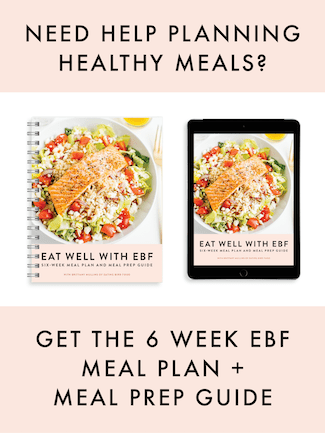 Apparently lots of other people are obsessed as well because there are a bazillion spiralized recipes on Pinterest and heck, my friend Ali even has a blog and a new cookbook all about spiralizing! Soooo it’s officially time to break out your spiralizer (or buy one if you don’t have one yet) because this month I’ve teamed up with five of my favorite food bloggers to give you six mouthwatering spiralizer meals… including this jerk seasoned shrimp with plantain noodles. 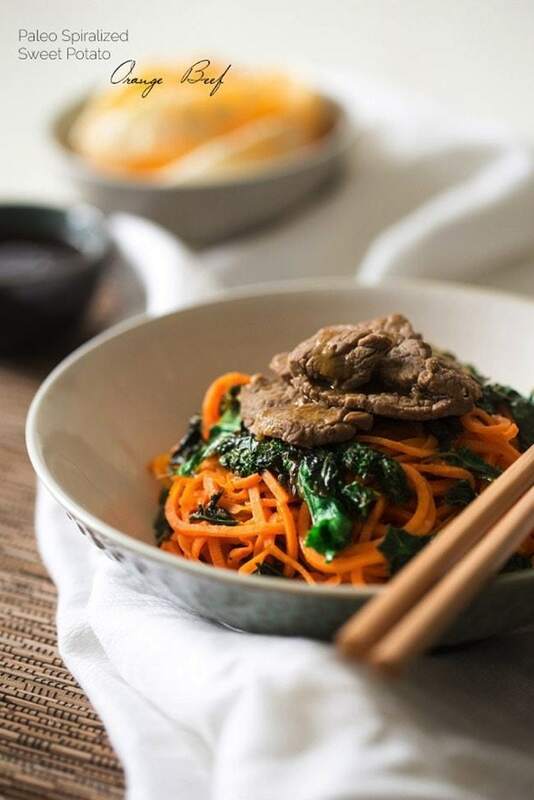 Orange Beef Stir Fry with Kale — This orange beef stir fry is served over sweet potato noodles for a healthy, Paleo-friendly meal that is quick, easy and perfect for a weeknight. You won’t even miss the take-out! 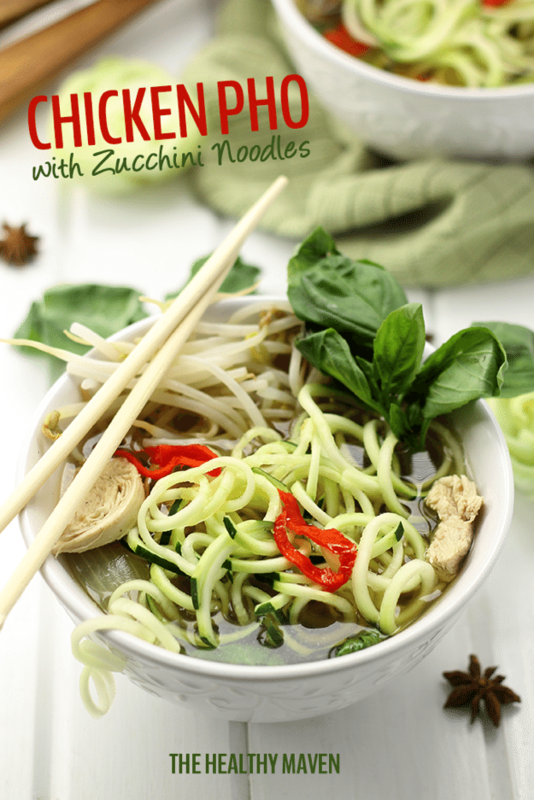 Healthy Chicken Pho with Zucchini Noodles — Homemade Vietnamese Pho soup that’s been healthified with zoodles and packed-full of veggies. Don’t be intimidated, this pho is a lot easier to make than you think! 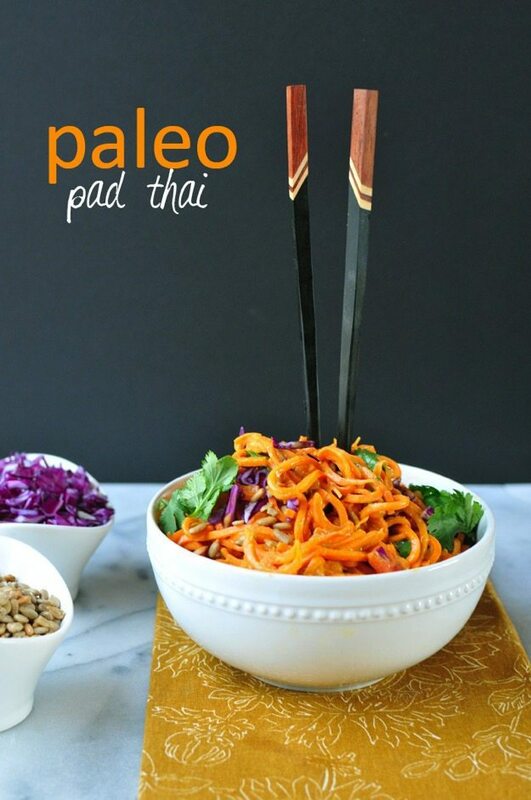 Paleo Pad Thai with Carrot and Sweet Potato Noodles — This pad Thai is completely grain-free (using spiralized carrots and sweet potatoes), completely nut-free (using sunflower butter), and completely over-the-top delish! You’ll want to lick the bowl when you’re done! Creamy Pasta Alla Vodka — A dairy-free creamy vodka sauce loaded with crispy prosciutto, shallots, basil, and garlic over zucchini linguine will quickly become a staple in your house. 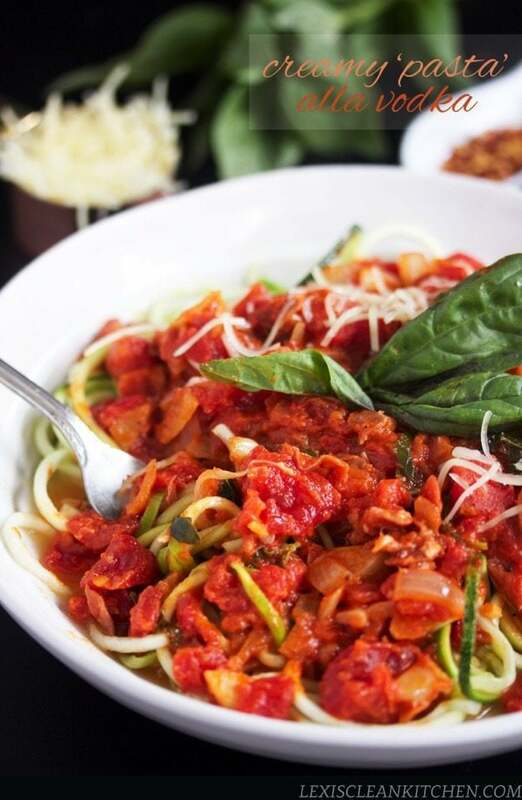 The perfect pasta alternative of your favorite classic dish; guilt-free! 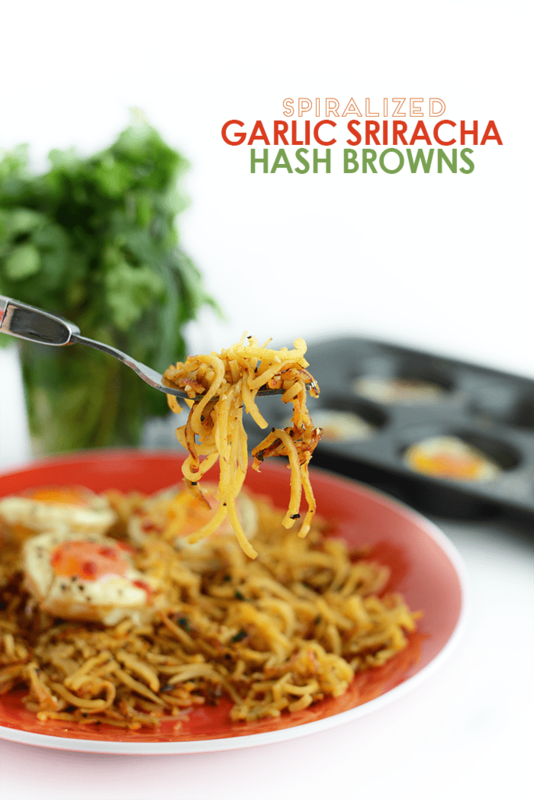 Garlic Sriracha Hash Browns with Baked Eggs — Got a yam? Make these paleo spiralized hash browns flavored with garlic and sriracha for a flavorful and filling breakfast paired with baked eggs! Don’t they all sound delish?!? Last but not least, here’s a little about my dish. The plantain noodles crisp up nicely when sautéed in a little coconut oil and make a crunchy bed for sweet and spicy jerk seasoned shrimp. 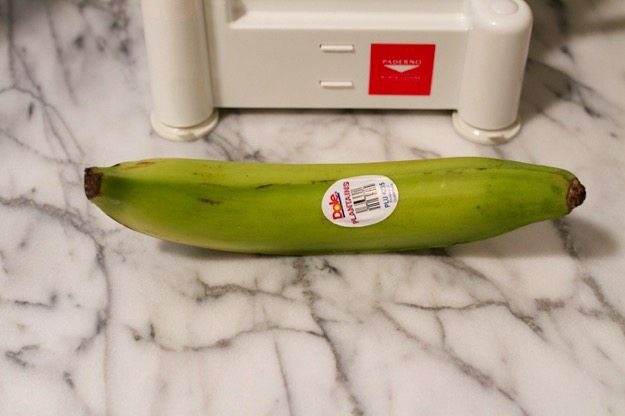 One word of advice when buying your plantain, look for one that is large, relatively straight and most importantly, green. I normally love yellow/brownish plantains because they’re sweeter, but those are too soft to spiralize. A green plantain on the other hand will create lovely noodles. 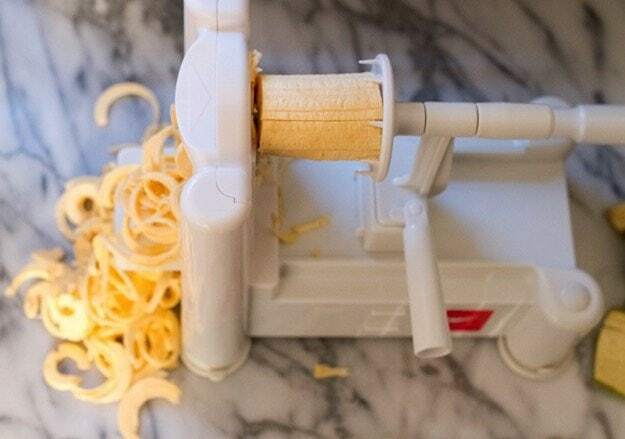 Oh and if you’re looking to buy a spiralizer, definitely get the Paderno Spiral Slicer. I actually started out using a Joyce Chen Spiral Slicer and recently upgraded to a Paderno and I like it 10x better. It not only more sturdy, but it includes three blades for different size noodles and cuts the noodles more uniformly. I rarely cook with jerk seasoning, but after making this dish I’m convinced I’ll be using it more. It’s got heat, a hint of sweetness and tons of flavor. It worked beautifully on the shrimp in this dish — especially with a little creaminess from the coconut milk. 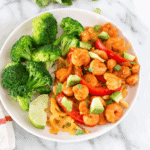 We adored the Caribbean flavors of the jerk shrimp paired with the crunchy texture from the plantains and I loved how quick and easy it was to prepare for dinner on a weeknight. 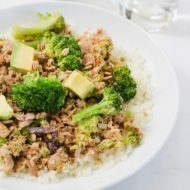 Once you have the plantain spiralized and your veggies chopped this recipe comes together in no time! I’ll definitely be making this recipe again and again. I hope you like it as much as we did. 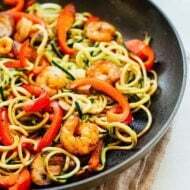 Take your tastebuds on a trip to the Caribbean with sweet and spicy jerk shrimp served over a crispy bed of spiralized plantain noodles sautéed in coconut oil. Heat coconut oil in a large skillet of medium-high heat. Add onion and garlic and sauté until fragrant. Season with salt and pepper to taste. Add in red pepper and cook another 1-2 minutes. Add in jerk seasoning and stir. Reduce heat to medium, add shrimp to the pan and cook for 4-5 minutes or until shrimp are cooked through. Add coconut milk to the pan and stir. Remove from heat. 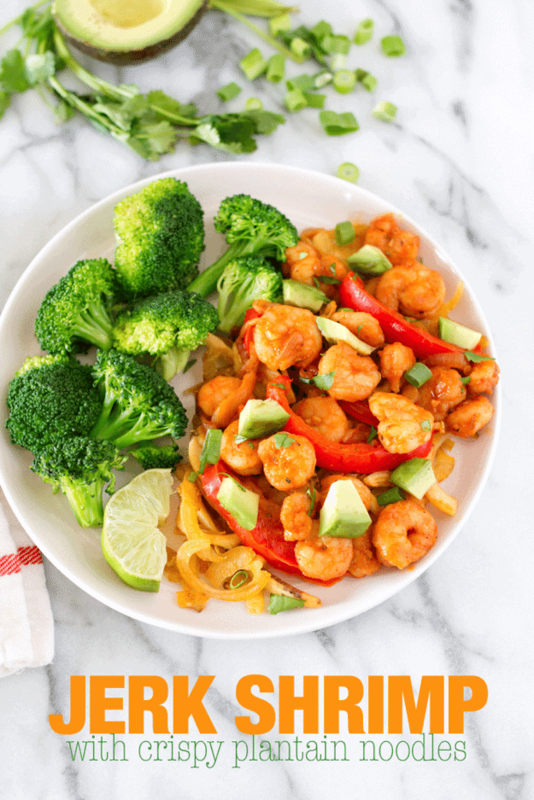 While shrimp are cooking, heat another skillet of medium-high heat and add 1 Tablespoon coconut oil. Gently place spiralized plantain noodles into the pan and cook, flipping with a spatula throughout the cooking process. Sprinkle on a little salt while the plantains are cooking. Remove from the pan once the plantains have reached your desired color and texture. Some pieces will be crispier than others. 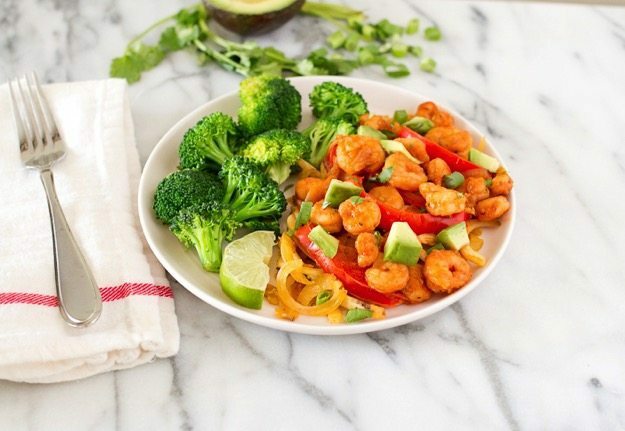 Divide plantain noodles on to serving plates, add cooked shrimp and sauce and top with avocado, cilantro, green onion. Squeeze a fresh lime over the shrimp if using and enjoy! 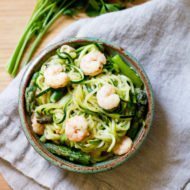 Have you tried spiralizing yet? If so, what’s your favorite thing to spiralize? I have never thought of spiralizing a plantain, this is so great! Jerk seasoning adds such a great flavour punch, this dish sounds super yummy. I am also looking forward to trying the pad thai. Plantain noodles is the ONE thing I haven’t tried on my spiralizer yet. Clearly, this is going to be my dinner. For the next 10 days because it sounds SO yum! Pinned! Just showed this to Curt and he asked if I could make this for dinner tonight! So this is happening!!!! I had no idea you could spiralize a plantain! I love plantain chips, but no one else in my family does. I’d probably be the only one to eat this (oh darn!). How hot is the jerk seasoning? I’m not terribly fond of hot for hot’s sake. I got my jerk seasoning from Whole Foods, in the bulk section. It definitely wasn’t too spicy — especially with the coconut milk. I can’t wait to make this. Jerk anything makes me think of my trip to Jamaica and since I’m heading back next month it’s only right to kick it off with this recipe! Totally agree. I’ve never been to Jamaica but I’d LOVE to visit. I’m ready for the beach!!! I LOVE that you spiralized a plantain!! SO creative. This is AMAZING!!! I don’t have a spirulizer and now I have envy. And have I mentioned that I love plantains??? Wow, looks so yummy, I will ask my wife to prepare this! Thanks for the Idea! Never thought to spiralize a pantain! we will be right over 🙂 a few months ago we tried spiralizing a plantain but for some reason it did not work out that well for us, now this gives us motivation to try again! I’ve had jerk chicken, but never jerk chicken. Sounds good! I made this on Saturday night, using a vegetable peeler to “spiralize” my plantains. It was totally worth the effort! My husband isn’t always a fan of my substitutes for “regular” starches, but he was bonkers for this. So fresh, so summery, and so flavorful! I could eat this weekly. I now need to purchase a dang spiralizer so I can do so with much less effort and risk to my digits! Gah! I’m so happy that you and your husband enjoyed it. My husband loved it too! One question.. I’m assuming the plantain should be green?! Woo-hoo! You’re going to love your spiralizer! Yes, the plantain should definitely be green otherwise it turns to mush. OH MY- I got my spiralizer and have used it every evening since then!!! So awesome!! I just have to make it to the market that has plantains!!!! Thanks Brittany!!! These are amazing, and the best part is that my whole family loves them! !